RTE journalist and Bertie Ahern admirer Claire Byrne found herself having to deal with a very nasty situation at the weekend. The incident was so serious, so obnoxious that she felt compelled to give it top priority on her weekly current affairs show, Saturday with Claire Byrne. Never mind war, famine, political crisis or international terrorism, this was a matter so serious that the politicians on the panel were pressurised by Byrne into giving an immediate judgement on the matter despite the fact that they had no prior knowledge of what had occurred. And what was the dreadful incident? Fine Gael TD Alan Farrell posted a satirical critique of three Fianna Fail members of the Cowen family on his Facebook page. Farrell posted a mock up poster from the movie Back to the Future, with a picture of Barry Cowen and Michael Martin (not a member of the Cowen family) accompanied by a legitimate critique of the political policies of Ber, Brian and Barry Cowen over the past number of decades. Probably because of her admiration for former Taoiseach Bertie Ahern Claire Byrne was outraged by this ‘attack’ on an ‘innocent’ Fianna Fail family. She first addressed her outrage at Fine Gael TD Regina Doherty. Byrne: And what he’s saying in each of those instances is that the Cowen family and Fianna Fail put the interests of Fianna Fail before the interests of the country. It is below the belt stuff, isn’t it Regina, it’s pretty nasty? What!!! A Fine Gael politician makes the political point that three Fianna Fail politicians, who coincidently happen to be members of the same family, put the interests of their party before the interests of the country. I challenge Claire Byrne to state exactly what is wrong with that opinion. What exactly is nasty, below the belt or indeed untrue about Farrell’s very funny, 100% legitimate piece of political satire? 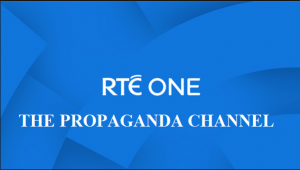 It really is worth looking at this broadcast in detail because it’s a good example of how far the establishment media and in particular journalists in RTE have become politicised in favour of the ruling political elite. Byrne begins by pressurising Fine Gael TD and Government Chief Whip Regina Doherty into expressing outrage over the incident despite the fact that Doherty had no knowledge whatsoever of what had occurred. Byrne: It is below the belt stuff Regina isn’t it, it’s pretty nasty? Doherty: (Making an immediate, uninformed judgement). I didn’t see it until you put it in front of me a second ago. I had to double look at it to see was it a joke or somebody else. It’s not something that I could ever subscribe to. When you actually have to revert to being personal between two politicians or two political parties, I think you’ve lost the argument, I think it’s a pity. Clearly Doherty was afraid to challenge Byrne’s outrage so she submissively fell into line. But Byrne was not happy with that, she wanted more. Byrne: So will you be speaking to Alan Farrell in your role as Chief Whip about that? Doherty, probably fearing she might be seen as disloyal to a fellow member of the political elite, reassured Byrne of her willingness to deal with Farrell’s ‘pretty nasty’ behaviour. Doherty: I’m not happy about it but I’ve just seen it now and I’ll talk to him later on maybe. Byrne then turned to Fianna Fail TD Jim Callaghan who also had no knowledge whatsoever of the incident but was more than willing to fall in line with Byrne’s outrage. Byrne: Jim have you seen this? Byrne: Here I’ll just give you a copy of it there. Callaghan: (instantly and without reading the article) I don’t like the idea of politicians referring to the families of other politicians. He (Farrell) shouldn’t be making personal attacks on people’s family and it’s something I’d never do and I don’t think he should do it. Later on in the programme former Environment Minister and Labour Party TD Alan Kelly also criticised Farrell’s post, saying it was “downright stupid”. So let’s clarify where these politicians and this RTE/Fianna Fail supporting journalist stand on the issue of political critique/satire. They believe that it is unacceptable for any politician (in this case, Alan Farrell FG) to criticise another politician (Barry Cowen FF) by referring to other members of that politician’s family who are or were politicians (Ber and Brian Cowen FF). So, for example, the actions and policies of Brian Cowen, without doubt the most incompetent Taoiseach in Irish history, cannot be referred to in a critque of his politician brother Barry because they’re family. Similarily, the actions and policies of the criminal Fianna Fail politician Charles Haughey can never be used in a critique of his son Sean Haughey, because they’re family. And so on across the many, many Irish political dynasties that have done so much damage to Ireland and its people over the decades. This, of course, is an idiotically bizarre idea because such references, such critiques are routine and totally legitimate. Alan Farrel committed, or was perceived to have committed, the most heinious crime any Irish establishment politican can commit – he publicily mocked a fellow member of the ruling political elite. The exchange of jibes and insults within the confines of Leinster house is fine, all politicians know it’s just a cynical game. But to publicly lampoon a fellow member of the ruling elite, particularly on a hated social media platform like Facebook, is unforgivable. That’s probably why RTE journalist Claire Byrne was so angry, that’s probably why she used her immensely powerful media platform to bring Farrell to heel. Within minutes of Byrne’s strong disapporval at this insult to her beloved Fianna Fail, the cowardly Alan Farrell removed the offending article from his Facebook page. A disturbing example of the power of the establishment media. My complaint centres on the biased panel selection on the Marian Finucane Show as broadcast on Sunday 4 September last. RTE: A mouthpiece for a corrupt regime? There is no evidence or even a claim that the murdered MP Jo Cox was the subject of abuse on social media. The only mention I am aware of is that she received ‘malicious communication of a sexual nature’ at her parliamentary office. This could have been by phone, letter, email, in person or social media. But this lack of evidence has not stopped many Irish politicians and mainstream media jumping on the hypocrisy wagon to cynically exploit Ms. Cox’s brutal murder. One particularly disgraceful example of this exploitation of a murder to promote an obvious agenda occurred on RTEs The Week in Politics. The panel, as usual, was heavily weighed in favour of the government/establishment. Representing the establishment view was Dara Murphy Fine Gael and Thomas Byrne Fianna Fail. Journalist Elaine Byrne and the presenter of the show, Aine Lawlor, represented mainstream media. Against this stacked panel was Mick Barry of AAA/PBP, representing left wing politics and the anti-establishment view. The bizarre line of questions put to Mr. Barry clearly exposed the biased agenda of RTE and is worth analysing to demonstrate that truth. Aine Lawlor: Staying with the Irish response to immigration, we have a short clip of the controversial UKIP poster that attracted a lot of attention shortly before Jo Cox was murdered. Viewers were shown a news clip of a British right wing politician promoting a right wing poster in favour of Brexit shortly before a right wing extremist murdered Jo Cox then, bizarrely; Lawlor put the following question to left wing politician Mick Barry. Why is the politics of fear travelling particularly, as it seems, with a lot of working class voters, Labour voters, left wing voters in Britain? Mr. Barry, while in the process of condemning extreme right wing politics in Britain and America, was interrupted by Lawlor. But you know here in the past turbulent, painful years there were many people on the far Left who did target politicians personally. Do you regret that, I know there’s a lot of anger out there but has there been too much personalised anti politicians campaigning? So Lawlor moved from discussing extreme right wing politics in the UK and the right wing murder of Jo Cox to asking Barry to express regret for the angry reaction of Irish citizens to the wholesale destruction of their lives by mainstream politicians. The Fianna Fail politician on the panel, whose party was principally responsible for the catastrophe, was not asked to express any regret for his party’s actions. Neither was the right wing Fine Gael politician whose party ruthlessly continued and added to the suffering of Irish citizens. This biased strategy of showing a news clip and then demanding a condemnation or an expression of regret has become common practice within RTE current affairs and seems to target only Sinn Fein and left wing politicians. Clearly puzzled by Lawlor’s line of questioning Barry asked her what she was referring to. I’m referring to a number of incidents which I think everybody else on the panel would… I’m not going to single out specific incidents because I don’t want to get into the ins and outs. I’m talking about the way politicians were harassed at their homes, I’m talking about the online abuse that they got, I’m talking about a level of protest that has been endured by politicians here and certain politicians in Britain. You’re condemning it on the far right, I’m simply asking do you regret and deplore it on the far left as well. Lawlor’s comment ‘I think everybody else on the panel would…’ suggests she was about to declare that everybody else on the panel agrees with her comments and her line of questioning. The Fianna Fail and Fine Gael politicians were then allowed to join the attack on the so-called far left with little interference from Lawlor and again were not asked to condemn or express regret for the catastrophic damage their respective parties have inflicted on Ireland and its people. When they finished their hypocritical and largely inaccurate comments Lawlor once again attacked Barry and left wing politics. You’ve heard the two politicians beside you saying there are issues with some people on the Left and the way they have been harassing politicians – do you deplore that kind of individual harassment? Keep in mind that the issue under discussion was the activities of UK right wing politicians and the murder of MP Jo Cox by a right wing extremist. Ireland suffered more than any other country in the world as a result of the global economic collapse in 2008. The reason Ireland suffered so much is that, over decades, our corrupt political system created an environment of zero regulation that allowed bankers, property developers, lawyers and other elites to do as they pleased. The response of the Irish people to the catastrophe visited upon them by corrupt politicians was the most peaceful, most responsible in the world – without exception. RTE, while always conservative, was once a relatively professional and well balanced broadcaster. 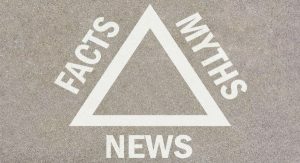 Since 2008, and particularly since a significant percentage of Irish citizens began to rebel against political corruption, the broadcaster has become little more than a mouthpiece for the corrupt political regime. I wrote the other day about the disgraceful bias shown by RTE presenter Sean O’Rourke during a discussion between Socialist Party TD Paul Murphy and Suzanne Lynch, Irish Times European Correspondent in Athens. It is clear to even the most uninformed observer that O’Rourke supports the Government/establishment side in the ongoing Water Tax war. O’Rourke doesn’t seem the least bothered about his unprofessional behaviour and, it also seems, RTE management have no problem with his bullyboy tactics when interviewing those who are opposed to his obvious pro-establishment opinions. He puts great effort into steering discussion in favour of his own political opinion and, when necessary, he uses the tactic of interrupting those opposed to his views in support of those who are of the same mind as his. His bullyboy tactics against Paul Murphy were again used in a ‘discussion’ between Labour Senator Mary Moran and Cllr. Michael O’Brien of the Anti-Austerity Alliance. O’Rourke made it very difficult for Cllr. O’Brien to discuss the reason for the protest. Neither was Senator Moran interested in discussing the substantial issue, she simply kept expressing outrage at what she perceived was an attack on democracy and agreeing with Sean O’Rourke as he attacked the protester’s ‘thuggery’. Here’s the relevant section of the discussion which centred on the throwing of a cone at a Guard. O’Rourke: You don’t stand over it. Would you care to put it a little bit more strongly, maybe think about condemning it? This is bullying. In O’Rourke’s poliltical opinion Cllr O’Brien was not strong enough in his reaction to the alleged incident. Cllr. O’Brien: I’m opposed to the throwing of objects. The point I was going to make Sean was the Guards drew batons on people and I saw people from the community I represent with injuries inflicted upon them by the Guards. Later when O’Brien was getting the better of Senator Moran, O’Rourke again interrupted, changing the direction of the discussion. O’Rourke: What do you say to Alan Shatter the former Justice Minister, a representative of the people of Dublin South saying that he had abusive insults hurled at him, his car was thumped and kicked by some protesters, it was a clear example of thuggery. Senator Moran: It was, absolutely. O’Rourke is clealy showing bias here. He begins with a quesiton and ends by expressing his own strong political opinion. Senator Moran was clearly delighted with O’Rourke’s strong support. O’Rourke: Do you condemn thuggery or do you accept that it was thuggery? Cllr. O’Brien attempts to make his point but again O’Rourke interrupts. O’Rourke: Are you saying you do not condemn the violent actions of some people who showed up last evening? O’Rourke: Do you condemn them? Cllr. O’Brien: Yeah, I’m opposed to that. O’Rourke: There’s a difference between being opposed to something and condemning it? Cllr. O’Brien: Well, I do condemn the throwing of objects and conduct of that fashion. As Cllr. O’Brien tries again to discuss the reason for the protest he is, yet again, interrupted by O’Rourke. O’Rourke: Were you not in a position last night to appeal to people to restrain themselves, to cooperate with the Gardai? Cllr. O’Brien explained that protesters were asked by organisers not to allow themselves be provoked by Gardai because a violent response would be used by media to discredit water protesters. And of course, that’s exactly what Sean O’Rourke and RTE were doing. 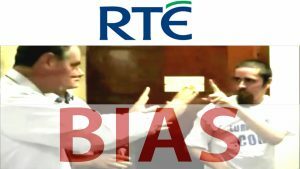 It’s odd that RTE management don’t seem to be aware of the massive damage such bias is doing to the station’s credibility.